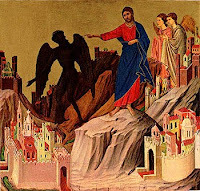 One of the interpretations of this text that I have favored in recent years is that Jesus resisted temptation to do even things that have good results. If he turns stones into bread, he can feed the hungry people in the whole world. If he gives his allegiance to the devil, the whole world will belong to Jesus in an instant. If he jumps from the temple pinnacle, God will perform a flashy miracle, which could show people who Jesus really is. This interpretation has served me well in the last few years, as I am person who is tempted to commit to or engage in too many things—especially endeavors that will produce good results. And yet, in a week when I am confronted with this text, I have too many things to do. I live in an out-of-the-way place in West Virginia yet am part of a connectional church, and so I have to drive pretty far to get to mandatory meetings and events. So this week, I have a pastors’ meeting on Tuesday (a 2 hour drive time one way—and that’s without any new snowfall) and on Friday an all day workshop which touches on an area of continuing education that I really need (3 hours one way.) In between I have a Shrove Tuesday event at my church followed by hosting the speaker overnight in my home; an Ash Wednesday service the next night (for which I still have things to prepare); a Church Council meeting Thursday night. In fact, the week is so busy with these and my regular responsibilities that I have asked my husband to preach for me this Sunday because I had no idea how I was going to write a decent sermon this week. The irony of facing this text this week produces for me more questions than answers. I’m doing too much, but following the way of the cross means suffering. Is doing too much pastor-stuff the right kind of suffering? Are the things I am doing a distraction from my purpose as a servant of Christ, or are they the fulfillment of that purpose? Have I failed to let scripture lay its claim on me? Or maybe I am exhibiting the same lack of understanding of Scripture that the devil does in his scriptural smackdown with Jesus. Should I—a person who has come to be pretty good at discerning whether or not to take on new commitments—cut myself some slack for this one unusually busy week, especially given that this week in the church year has greater demands than most other weeks? I’m certainly not practicing what I would normally preach this week. Which raises the question of pastoral integrity for the preacher. Any way you slice it, I’m tempted by something similar to what Jesus was tempted with: doing things that are good. Thankfully for the most part, I’m not involved in these events because of the results they’ll produce (with the exception of the continuing ed event). Worship on Ash Wednesday is not for “results” but for the gathered people of God to acknowledge both our mortality and sinfulness in the face of God’s holiness—a message I clearly need to hear. Only God can redeem our broken and sinful lives. I suppose God has a lot of work to do with me this week. Jenny … I just came across your site for the first time and really appreciate your transparent reflections on the Gospel for this week. It's been one of those weeks for me, too, and good Spouse would just LOL if I asked him to preach. A temptation nevertheless … but I digress. 2) the tyranny of the urgent is well disguised in the distracting temptation of the urgent. I'll know now to check in on this site earlier in the week ….